Why shop for furniture when you can shop for custom Amish furniture? The only thing better than the best quality home furnishings at the most competitive prices is having the ability to customize it all to your liking. While most furniture stores may allow customers to choose between two different colors, the customization often ends there. Aside from designing and building your pieces, shopping at Amish Furniture Originals Company enables you to make a variety of choices. Aside from the type of pieces you want and the style, you will be amazed at what you have to choose from. From there your pieces are custom built with the finest of hand craftsmanship techniques, all for you and your home. So what are some of the decisions you will be making about your custom Amish furniture? First you decide which room you are shopping to furnish. Whether you need one room or your whole home furnished, you can begin the browsing. Maybe you need a single accent table or an entire set up for your home office. Either way we can accommodate you. From the pieces you want you can begin to browse selections and decide on the size you want. For example, for wine cabinets alone there are three different styles to choose from. Generally, you will next be looking at the different styles of American hardwood you want for your Amish furniture. All the options are crafted from kiln-dried lumber, by hand. You can choose from the likes of beautiful oak, cherry, brown maple and quarter sawn white oak, to name a few. That’s not the end of the decision making process, as you will also choose the finish you want. Other pieces of custom Amish furniture come with different choices to make, and some of it is still about color. For example, you may choose different hardware for either accent pieces or functional purposes. Maybe you want wood doors or glass doors. You may even be choosing between standard or beveled glass. It depends on what furniture you choose and what your custom options are. The bottom line is that your furniture will be tailor made to your liking to be one of a kind. After making the choices to customize your new furniture, the pieces are custom built. When you buy custom Amish furniture from Amish Originals, you are actually investing in family heirlooms that are certain to be passed down for generations to come. Part of what makes this process so special is the tailor made selection you get to take part in creating. We also pride ourselves in offering the best customer service around, so you have someone to work with to help you make decisions about your home furnishing, should the need arise. We have been serving customers in and around the Central Ohio area since we opened our doors in 1992. There are many reasons our customers return to us time and time again. 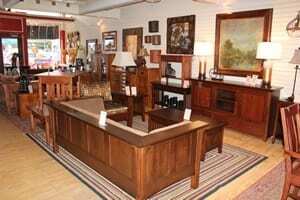 One of the main reasons, however, is the tailor made custom Amish furniture you get when you shop with us.